The fast answer is, Kinesava is the Paiute God of Trickery. But there’s much more to the answer than that. Kinesava is the southernmost mountain peak in Zion Canyon, the name of a street and a neighborhood in Springdale, and the name of this web domain. I snagged “kinesava.com” as a domain name many years ago when it was available for just a few dollars – the cost of registering it. Today, you can’t get simple “.com” domain names unless you buy them from someone else. I’ve always loved owning kinesava.com. For me, it’s like owning a block of “upside down Jenny” stamps or a “Honus Wagner” baseball card (both sell for millions). Kinesava.com is probably only worth three or four thousand dollars on the market but it’s worth much more than that to me. One reason is that I live in the Kinesava Ranch subdivision that is directly beneath Mount Kinesava. You can just see the white limestone peak of Mount Kinesava from my house if you know exactly where to look. Mount Kinesava is a challenging hike, but you don’t need technical climbing skills and you can do it in one day. (IF you start early and you’re in very good physical condition. It AIN’T the East Rim Trail.) If you search the hiking and climbing websites, you can find anguished laments about how my house is right on top of the “traditional” trail. There is even a really nice picture of my house on one of them. 1 – I didn’t do it. Chuck Warner, who created this subdivision, did it. Or maybe Felton, who owned the land before Chuck. Somebody’s house would be here in any case. 2 – I really wouldn’t mind a few hikers going across my land. I was outvoted in the HOA meeting and I do believe in democracy. 3 – Zion Park discourages this route. (I asked.) The official blessed route starts down in the Anasazi subdivision where they have a parking lot well away from State Road 9. It’s a little longer, but it goes to the same place. 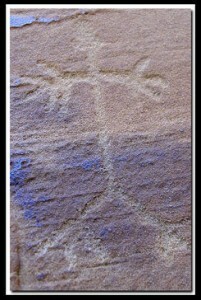 There are some great petroglyphs not far from the summit of Mount Kinesava and one of them might be Kinesava himself. This group of petroglyphs is still in great shape, partly because anybody who visits them has to really work to do it and that keeps the vandalizing hoi polloi away. I have to wonder why the Paiutes who carved them climbed way up there. It had to be really difficult because it’s not easy today with climbing boots and plastic water bottles. The view from the top of Mount Kinesava might be the best in the Park because it’s the southernmost peak in Zion. You can see Tabernacle Dome to the north and the Virgin valley to the south as well as much of Zion Canyon. The massive West Temple looms right in front of you. The other reason I love this domain name has to do with Kinesava, the Paiute God of mischief and trickery. Most cultures have a god like this. The ancient Greeks had Dolus. Ancient Egypt had Seth. Most southwestern native Americans associated Coyote with trickery but the Paiutes called him Kinesava. My own culture, the Vikings, had possibly the most famous “God of Trickery” – Loki. You might remember the Jim Carrey movie, The Mask. The title is taken from a wooden mask that was supposed to be Loki’s mask. This mask turns the wearer into a trickster with god-like power. (No such mask actually exists in the old stories, but the movie is great.) I like to tell people that Loki just moved to a sunnier climate and took on a different name. Although Kinesava’s trickery could be damaging, like telling the enemies of the Paiutes where they were, or starting fires, he was not the god of evil. That was Wainopits. There’s a mountain named after him too. It’s an unremarkable knoll on top of the plateau to the east of the upper narrows. Owning the domain name of trickery feels good to me. It’s often my inspiration when I’m writing these articles. Thanks for your reports and your website. Keep up the good work. Thanks VERY much Bill. I’ve been doing this for close to a year now with very little feedback of any type. You try hollering down a well continuously for a year and see if you can keep it up. Your encouragement means a lot to me. But as much as I like the positive feedback, I NEED course corrections even more. A fundamental philosophy of mine is that people can’t see themselves as clearly as other people can. So when I need to do something different, please tell me. I won’t promise to do what you say. But I will promise to listen carefully.